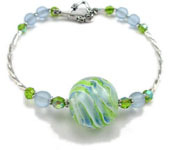 Glass & Jewelry Artist specializing in lampwork beads & custom jewelry. 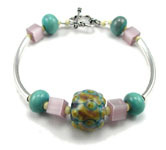 Copper green and soft pinks blend give this bracelet a nice touch of spring. Sterling silver curved tubes, copper green spacers, and pink cubes add a slight Art Deco feel. Fits up to a 6 1/4" wrist. This bracelet just has spring all over it. Sterling twisted curved tubes, a focal with encased blue and green swirls and glass beads for accents, fits up to a 7" wrist. 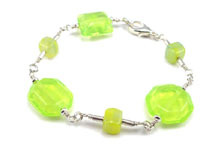 Bright yellow lampwork beads, pressed glass beads, and sterling silver all combine to make this eye-catching bracelet that makes you think of warm summer days. Fits up to 6 1/2" wrist.